Lawrence & Associates > I Want to Change My Attorney. What Steps Should I Take? I Want to Change My Attorney. What Steps Should I Take? 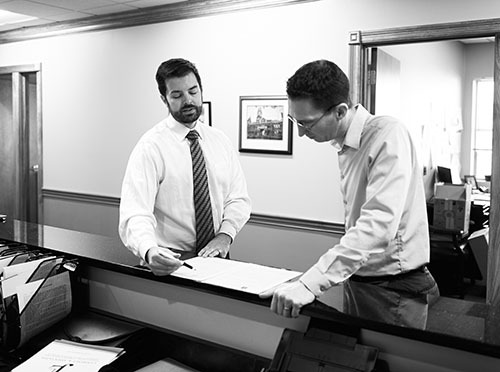 One of the most common questions Lawrence & Associates’ attorneys receive, is about how someone can change attorneys. You should be able to trust your lawyer, and trust that your lawyer has the education, experience, and training to see your case through from beginning to end. Unfortunately, there are bad lawyers out there, as well as lawyers who get into criminal trouble, who retire, or who move their practices to other places far from your home and court. Luckily, you are not stuck with the attorney who does any of these things, or even with an attorney that you don’t think is devoting their full attention and resources to your case. Below, we answer some of the most frequently asked questions about changing attorneys that our prospective clients have. Does It Cost Me Extra Money to Change Attorneys? This is the good news: in all injury cases, the answer is no. When you change attorneys mid-case, the first question to ask is whether the old attorney is guilty of any kind of ethical or legal misconduct related to your case. If so, the old attorney is not allowed to get any fee at all, and the new attorney simply earns whatever fee is due by law or contract. If the old attorney is not guilty of case related misconduct, then both attorneys are still limited to the fee due under the contract or the prevailing law. For example, let’s say Attorney A is fired by his client because he was moving too slowly for the client’s taste, or lost some paperwork the client sent in. This could be shoddy work, but it doesn’t rise to the level of misconduct. The client then goes to Attorney B, who successfully resolves the case. Both Attorney A and Attorney B put in the same amount of hours on the case. If the case settled for $12,000 and the contractual fee was 1/3 of that, then the attorney fee is $4,000 no matter how many attorneys have to split it. Since Attorneys A and B did the same amount of work, they’d split the fee in half and take $2,000 each. It’s no extra money to the client, but each attorney gets only a portion of the whole. For bankruptcy, the answer could be a little different. Bankruptcy attorneys are paid by the hour, although we often quote a flat rate for our fees because we know about how many hours are required to file a typical bankruptcy. Lawrence & Associates’ contract says that – if we are terminated for any reason – we must return any portion of a paid retainer that was not earned based on the number of hours we worked. So if we were terminated in mid-preparation for the bankruptcy, it is possible that some of the retainer would not be returned. If you then went to a new firm, that might cost you additional money because the second attorney would be duplicating at least some of the hours that we’d already worked. To further complicate that, some other law firms’ contracts says the entire retainer is non-refundable, meaning that terminating those firms won’t get you any of your money back. Therefore, changing bankruptcy attorneys could cost more. Will Changing Attorneys Delay or Hurt My Case? No. What hurts or delays your case is having an unqualified attorney on it in the first place. Most courts keep any deadlines that have been imposed, unless your new attorney asks for them to be moved due to the old attorney not doing things right the first time. Frankly, at Lawrence & Associates we are often frustrated at the slow pace other law firms take, and we think the odds are that switching from unqualified counsel to qualified counsel will make your case go faster, and have a better result, than what would have happened if you didn’t switch at all. When Should I Change Attorneys? If no one at the law firm is calling you back for days at a time, this is inexcusable and the attorney should be terminated. However, there are some things to think about that might be factors to consider. Is a knowledgeable paralegal returning your calls and answering your questions? If so, this is acceptable. Paralegals are to a law office what nurses are to a doctor’s office, and one of their functions is communication with clients on a day-to-day basis while attorneys are in court, in depositions, or inspecting accident scenes. As long as the paralegal is answering your questions, it is totally normal for the attorney not to personally make a second call to relay the same information. Does the law firm have a history of returning the calls promptly, and now that is no longer happening? That could be the first sign of a serious problem at the firm, but it could also be a temporary thing. Maybe a paralegal quit or someone got sick, and the firm is behind. You may want to make an effort to find out more in this situation before you decide to change attorneys. Honestly, we’re a little torn on this. Quite often, we receive complaints about the speed at which other law firms move, but when we get more details it is the system that is slow rather than the law firm. But sometimes – and this is especially true for personal injury claims – we look into the matter and find that the attorney really has been dragging his or her feet. For some reason, many attorneys that do not specialize in personal injury will decide to take on a case and not really know what to do with it. The first sign of complexity causes that kind of attorney to freeze, unwilling to give up what might be a good case, but unwilling also to ask for help so he or she can move forward. In cases like that, the client would be best served by moving on. If your attorney asks you to do either of these things, just find a new attorney immediately. We have had situations where we had to ask a client to help get medical records, but they are very few and far between – usually dealing with one very small medical provider who won’t send the records to an attorney. A good attorney not only knows the law, but also knows how to explain it to non-lawyers. We are supposed to be “counselors of the law” after all. Lawrence & Associates practices in only four areas of the law – personal injury, bankruptcy, workers’ compensation, and social security – because that is what we know. We won’t take a criminal or family law claim, because that’s not where our expertise lies. Other firms are not as disciplined, and can’t turn away a good case even if they don’t know how to do it. If your attorney can’t answer your questions, or the answers don’t make any sense, it may be time to get a second opinion. As much as we hate to admit it, some people think being an attorney means they are on another level. They aren’t, but you can’t convince them. That may make the attorney-client relationship really unpleasant, and if that occurs then you have the right to get rid of the jerk. And when it comes to criminal or ethical trouble, remember that a felony conviction results in an attorney losing his or her law license. Some ethical infractions result in the loss of a law license too. If your attorney is facing a criminal indictment or ethical hearing, they have other things on their mind and you may want to begin looking for new counsel immediately. How Do I Change Attorneys? First, don’t fire your old attorney until you’ve consulted with a new one. You could miss an important deadline while you are hunting for new counsel. And the rules about fee splitting, above, sometimes prevent you from finding a new lawyer if you wait too long. To use the $12,000 fee example from above, we’d be unlikely to take that case as Attorney B if 90% of the case were already done. The remaining fee is only $400 in that scenario, and any bad work the other lawyer had already performed would be baked in and difficult to overcome. You wouldn’t want to fire the old attorney right before a big deadline, only to find out that no other law firm will take the case! When we have a consultation with a prospective client who turns out to be represented, we often counsel you to make one more attempt to talk to your old attorney. If the facts are really egregious we might skip this step, but as mentioned in the bullet points above, sometimes there are reasons for the dissatisfaction and the attorney can shape up. If that one last attempt does not bear any fruit, and if we have already agreed we will accept representation in your case, we will instruct you to write a letter to the old attorney that says they have been terminated. There is no magic to a letter like that; just putting it in your own words is enough. Once that letter is sent, we ask for a copy and we have you sign our representation agreement and any other forms necessary to successfully complete your case. After that, we handle the rest and you don’t have to talk to the old attorney again. Are you interested in finding out more? Call Lawrence & Associates at 859-371-5997 or 513-351-5997. Or you can fill out your information at the Contact Us page by following the link. We’re Working Hard for the Working Class, and we want to help you!